My introduction to superhero cartoons was watching Batman: The Animated Series as a child, but I didn’t become aware of the larger DC universe until I happened upon a Super Friends marathon on Cartoon Network one summer afternoon. Comic books weren’t on my radar yet, and watching those campy old episodes revealed an expansive fantasy world where familiar faces like Superman, Batman, Robin, and Wonder Woman worked together and teamed up with a guy who talked to fish and some lucky kids who got to tag along with their dog. Over the course of that marathon, I was introduced to characters like the Flash, Green Lantern, Hawkman, Firestorm, and Cyborg as each different era of Super Friends was spotlighted, creating the impression that there was a limitless supply of amazing new heroes waiting to be revealed to me. I waited years for a cartoon that would give me the same thrill as those Super Friends episodes, which themselves became increasingly stale over time. I was always anticipating the next DC superhero to make a first appearance in the animated universe, and while the first two seasons of Justice League came close to capturing that childhood excitement, the same seven characters every episode eventually got a bit bland. By the time Justice League Unlimited hit the air, I was at the height of my superhero comics reading, binging on JLA and JSA collections thanks to a wonderfully well-stocked graphic novel section at my local library. I could barely contain my glee when I saw nearly all of those faces from the comics in the huge group shots at the start of “Initiation.” Those first few minutes of the JLU series premiere surpassed the exhilaration of that initial Super Friends marathon, and I continue to believe that no superhero cartoon has been able to match JLU in terms of sheer scope and creative ambition. 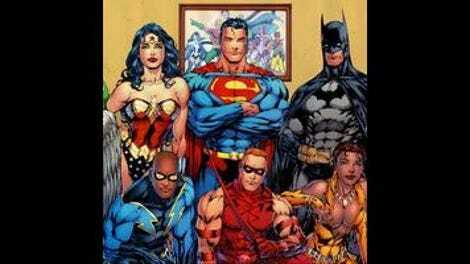 There are a lot of superheroes in the DC universe, and many of them have been members of the Justice League or the Justice Society. 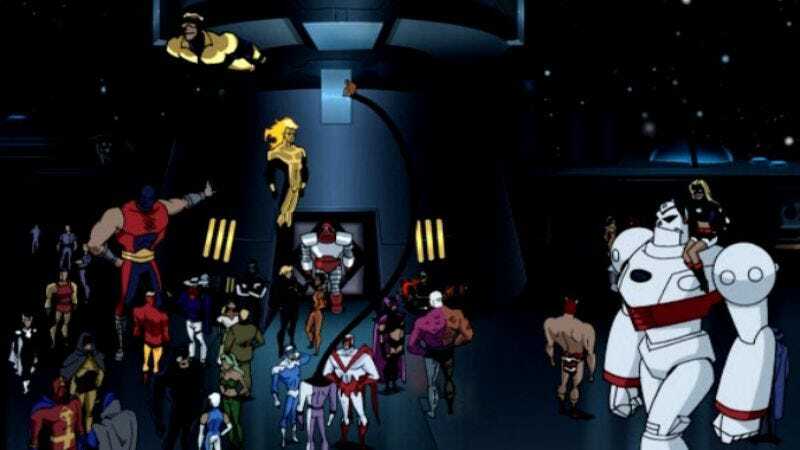 Justice League Unlimited takes that already significant roster of characters and adds members of other super groups like the Seven Soldiers of the Unknown along with previously introduced DCAU loners like Etrigan and The Creeper, creating a massive superhuman army that watches over Earth from a newly expanded space station. At the end of “Starcrossed,” Superman and J’Onn decided to rebuild the League, and while they’ve certainly built something much bigger and stronger than what came before, expansion comes with its own set of problems. This first season of JLU does a great job of showcasing some of the lesser-known faces of the DC universe, but it’s most notable for doing so in the context of an overarching story that is surprisingly political and focused on different philosophies about power. In “Initiation,” these competing viewpoints become clear as Green Lantern leads Captain Atom, Green Arrow, and Supergirl into Chong-Mai to stop a rampaging nuclear death machine. With so many characters, each episode looks at smaller groups operating together; a lot of the heroes that cameo in this episode will never have considerable roles on the series, but at the time this show was on the air, it was entirely possible that next week’s episode could follow the team of Vibe, B’Wana Beast, and Crimson Fox or some other bizarre grouping. The three rookie Leaguers joining the newly-goateed Green Lantern in this episode all get ample screen time over the course of this series, and their first mission establishes each character’s role in both the team and the show. A liberal curmudgeon with a heart of gold and an abrasive attitude, Green Arrow brings perspective to the League, providing a human point-of-view in a group of godlike beings. He wants to look out for the little guys, and he’s headstrong enough to challenge the rest of the League if they do anything that puts those people at risk. With a much larger team, the Justice League needs more than just Batman to keep it grounded, and Green Arrow helps fill that role along with The Question later in the series. Green Arrow isn’t quite as paranoid as his faceless teammate, but he provides a strong counterpoint to the rest of his idealistic comrades. What has always impressed me about Justice League Unlimited is the depth of its character relationships, always balancing the intense superhero action with personal drama that gave each episode stronger resonance. There are multiple romances over the course of the series—Wonder Woman and Batman, Green Arrow and Black Canary, The Question and Huntress, the Green Lantern-Vixen-Hawkgirl love triangle—but it’s the smaller relationships like Green Arrow and Supergirl’s friendship that really bring a sense of family to the team. Supergirl is young, blonde, and impulsive, reminding Green Arrow of himself at that age and pushing him to form a big brother bond with her that becomes even stronger than Supergirl’s connection with her cousin. And if Green Arrow is Kara’s big brother, Green Lantern plays her father, setting boundaries that she needs to grow as a hero and giving her chunks of tough criticism and tiny morsels of praise to encourage her progress. Stan Berkowitz isn’t the DCAU’s most remarkable writer, and he has difficulty keeping the dramatic stakes high for this entire episode. The first half focuses on the League arguing about how they should pursue a diplomatically complicated situation, and that conflict is much more intriguing than the action sequence that makes up the episode’s second half. Luckily, Joaquim Dos Santos’ debut as director elevates that action to new heights for this series. Dos Santos steps up after working as a storyboard artist on Justice League, and his remarkable skill at staging crisp, dynamic action is a large part of JLU’s appeal. A director who has gone on to work on Avatar: The Last Airbender and The Legend Of Korra, Dos Santos applies eastern animation techniques to give the action an intensity that can’t be found in most American cartoons. The first scene of the episode is specifically tailored to make Green Arrow look like as much of a badass as possible, despite the fact that he fights crime dressed like Robin Hood and armed only with a bow and trick arrows. The voice work in the DCAU has always been spectacular, but Andrea Romano outdoes herself with the casting on JLU, bringing in vocally distinct actors who can immediately establish their characters’ personalities with just a few words. General Hospital’s Kin Shriner brings a weathered bravado to Green Arrow that is a sharp contrast from George Ead’s Captain Atom, a country boy turned military man who follows orders and doesn’t ask questions. Green Arrow hasn’t appeared in the DCAU at this point, but it’s immediately clear from his vocal tone that he’s been doing this alone for a long time and he doesn’t need any extra help. Then there’s Nicholle Tom’s Supergirl, a hero that is far more immature than everyone around her but learns to grow up over the course of this series. As the first episode of a new series, “Initiation” could be a little tighter in the second half and spend more time introducing all those new faces that show up in the first few minutes, but it’s still a captivating debut that shows plenty of promise for the future. The story of four superheroes trying to stop a nuclear threat while dealing with the political repercussions of their actions is a step up from the kind of narratives presented in Justice League, and that combination of political intrigue and superhero spectacle characterizes the first season of JLU. The Justice League is bigger than ever, but what does that type of power entail? How would the world’s governments react? Who determines the jurisdiction of a group of aliens, gods, mutants, and vigilantes? These are the types of questions that are currently being asked in Justice League comic books, but JLU tackles them without losing sight of the fun that pulls people to superhero comics in the first place. A list of all the heroes that appear in this episode: Aquaman, Atom, Atom Smasher, Aztek, B’Wana Beast, Batman, Black Canary, Blue Devil, Booster Gold, Captain Atom, Commander Steel, Creeper, Crimson Avenger, Crimson Fox, Dove, Dr. Fate, Dr. Light, Dr. Mid-Nite, Elongated Man, Etrigan, The Flash, Fire, Green Arrow, Green Lantern, Gypsy, Hawk, Hourman, Huntress, Ice, Martian Manhunter, Metamorpho, Mr. Terrific, Nemesis, Obsidian, Orion, Question, The Ray, Red Tornado, Rocket Red, Sand, Shining Knight, Steel, Stargirl, Starman, S.T.R.I.P.E., Supergirl, Superman, Johnny Thunder & Thunderbolt, Vibe, Vigilante, Vixen, Waverider, Wildcat, Wonder Woman, Zatanna. Basically the best Justice League line-up ever. In the first shot after the opening sequence, there are members of the League that don’t appear in any other shots, including a big green creature, a brown guy with wings, and a man in blue next to Booster Gold that could be Blue Beetle (who never appears on the series). Jim Lee’s redesign for Huntress really is horrible. I hope everyone is ready for a whole lot of electric guitar over the next two seasons because that’s what we’re going to get.